I’m not a scientist (at all, trust me), but science and technology impact my daily life in critically important ways. I believe research should be the first step taken in creating and evaluating policy. I know that innovation is the way we begin tackling the unprecedented problems our country and world are facing. Two of the major issues raised at the March were protecting funding for Health and Human Services research and saving environmental protections aimed at reducing the human contributions to global climate change, and I could not agree more with fighting for these protections. Medical research is vital to improving the lived experience of women and families domestically and across the globe. Environmental protections are also a feminist issue, as food and resource scarcity disproportionately affects women and families, and, as the former State Department highlighted, there is a direct nexus between environmental degradation and human trafficking and forced labor. There are countless ways that science and technology improved the lives of women and families in the recent century, and I believe that science and facts should occupy an important role in our society and government. However, as a feminist, I always get nervous when we try to assert the “objectivity” of any facts or ideas. A feminist slogan in the 1970s and 1980s (perhaps some NOW members remember) read “Objectivity is Male Subjectivity.” While I believe that science has come a long way in addressing its sexist history, I think that, as most scientists would concur, the best place to start when addressing the problem of how to create a more feminist science is by looking at the history –by looking at the facts. We’ve spent centuries trying to dispel sexist assumptions and integrate the hard and soft sciences with women thinkers. However, there is still a substantial gender bias in the sciences based on these systemic historical notions. According to the U.S. Bureau of Labor Statistics, women are still underrepresented in STEM fields, comprising just 39% of material scientists, 28% of environmental sciences, 16% of chemical engineers, and 12% of civil engineers, while occupying 43% of the national workforce. Women are also largely underrepresented in technology industries, only accounting for 26% of the tech workforce. A big step towards creating a more feminist science will be in addressing who gets to participate in science. Critically evaluating the Intersectionality and positionality of who gets to seek out, interpret, and present our facts is vital towards obtaining a more representative science. But we still need to address who science is created for. In the medical field alone, there have long been a gender-bias determining who participates in medical clinical trials, which diseases get the most research funding, and whose pain and symptoms are taken seriously. However, this is beginning to change, and in the past half-century, we have seen incredible medical technological advancements for women, including the creation of breast cancer screenings, preventative immunizations for cervical cancer, and, of course, the proliferation of family planning technologies. In the tech and start-up world, creators and researchers are beginning to innovate for women, with apps like Bumble and start-ups like Thinx directly addressing the needs of women –needs that had long been ignored. Many of these innovations have been the result of increased representation and entrepreneurship of women in the tech and medical fields. This is not to be underestimated. But it has also resulted because of women like you and me. Scientific and technological advancement has always depended on recognizing a need. We have to bring the needs of women front and center in the world of science and technology to create a feminist science that benefits everyone, and that will take increased representation of women in the fields, but it will also take the lobbying and convincing of scientists to prioritize women’s issues. Medical advancements for women were not simply invented for science’s sake, but rather, they were invented because women demanded that their medical institutions take their health care seriously. Finally, we need to address who gets to fund science. 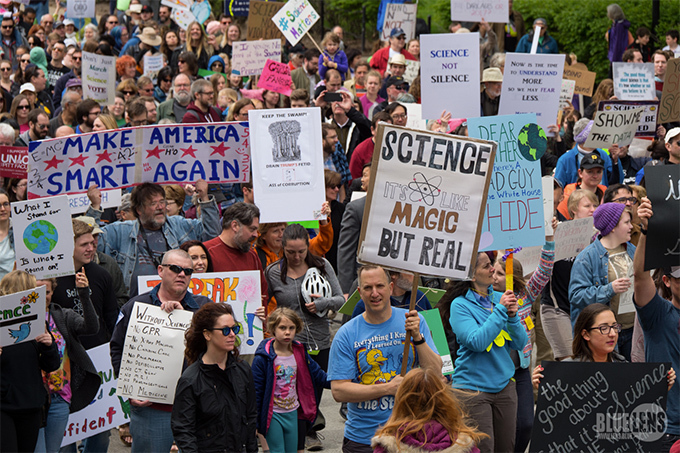 Many critics of the March for Science claimed that politicizing science robbed the field of its objectivity and value. However, because of the way that science and technology funding has been set up in the United States, science has always been political. The majority of research funding is allocated through government grants, from the National Science Foundation, National Institutes of Health, and others. The majority of scientific research that takes place in this country is paid for by your tax dollars and is allocated by your elected and appointed officials. The facts that are discovered, reported, and published are inherently political. Therefore, it is imperative that we hold our officials accountable and make sure that they adequately allocate funding towards research areas that affect women. Seeking to depoliticize science is naive at best, and at worst, it seeks to uphold a current structure that legitimizes the problems faced by women and refuses to appropriately address them. Creating a more feminist scientist will take all of us to instruct what science gets created and who gets to access its benefits. It will require us to step up and demand that our issues be addressed. It will take the courage of young women to pursue careers they have been told are not available to them. In the meantime, support science, respect scientific consensus but keep thinking of new ways to make innovation and the pursuit of knowledge benefit everyone, including women, equally. The creation, innovation, discovery, interpretation, publication, and funding of scientific facts are all profoundly human endeavors, and thus, we should always seek to make them more equal, more inclusive, and more representative.